It’s been a pretty hectic few days for us. 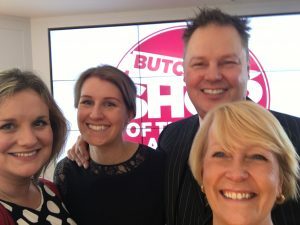 Hot on the heels of our recent pork pie accolade at the DeliciouslYorkshire Taste Awards at the beginning of November, Lynne and I travelled down to London with Emma and Alex for the Butcher’s Shop of The Year Awards. We’ve invested a lot into the business recently and have worked hard to offer something pretty unique for our customers. We’ve been really proud of what we’re now able to produce but it still came as a heart-stopping shock to learn that not only had we won the award for Best Butcher’s Shop in the North, but that we’d also gone on to win the title of Best Butcher’s Shop in the UK. We were so delighted that the judges were as enthusiastic about our business as we are: the application was a rigorous and detailed process (to say the least) but it was also very useful to step back from the day-to-day minutiae of running a butcher’s shop and realise that we have built something pretty interesting and unusual. With any business, but perhaps particularly so for independent butchers, there are challenges at every turn. Taking a holistic approach and evaluating what we were managing to achieve certainly turned out to be good for the soul. When the judges came to visit all we had to do was simply show them around and demonstrate that everything we said we were doing, we were actually doing! I would wholeheartedly recommend entering the competition when applications roll around again: it served to be a very useful exercise to step back and evaluate ourselves and the entire team have felt a real buzz from their invaluable contribution to this award. 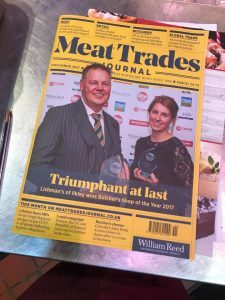 On those long, dark winter mornings it certainly warms the cockles to know that you’re getting up to come and work at what has now been recognised as the best independent butchers shop in the country…! 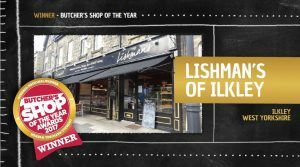 However, over the coming months you are unlikely to see anything ‘change’ at Lishman’s: just because we might have won a fancy award doesn’t mean that we’re going to be hiking up our prices, opening new shops or changing what we do. Our vision remains exactly the same: to offer the good, honest folk of Yorkshire the very best in the world of meat. Customers who can’t get to Ilkley as often as they might like can see what we’re up to on Twitter and Instagram as well as Facebook. If you’re looking to stock our charcuterie etc just get in touch with David and Ian, via our Trade Sales team.